The photo is from today’s morning walk with Holly. The bold, bright colors and the drops of water seemed fresh and alive. But what I saw when I viewed the image on my computer – so much bigger than on my phone – was … different. My early walk with Marc is almost back to “dark early”; sunrise was at 6:49am today. School buses are making practice runs for Monday’s first day. I’m certainly not wishing away summer, but it’s hard to ignore those signs. Of course it still feels like summer. Here in Georgia that usually lasts well into September! Thank you Carole and Kat for hosting another fun week! I can't tell you how many photos I've taken with my phone, only to be surprised at how "different" they looked on the computer! But August is a month for fading blooms after June and July's profusion, and we have autumn to look forward to. I can hardly believe you start school on Monday; we never start before Labor Day but then end up with a school year that lasts until the end of June once we make up snow days. 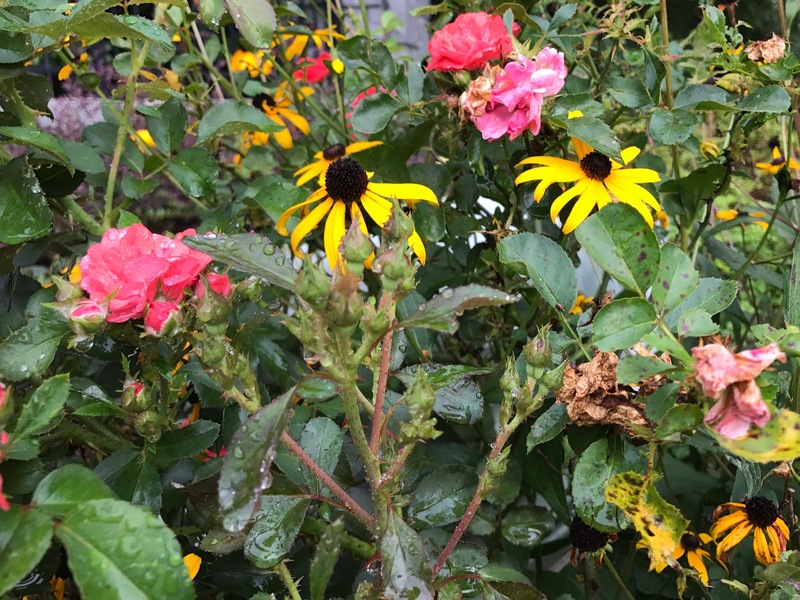 I think your photo captures August pretty well – still blooming and still pretty but showing those telltale signs of fading away. The light. I'm so sad to see the light fade away so quickly. Even in Utah summer heat lasts until September. Your haiku and your photo certainly are perfect homages to August. Love your haiku. I know i'm in the minority but I love fall! Dinner with candles, comfort food, etc. It happens every year no matter what we want! Summer is my favorite . . . but fall is a close second. My garden always looks bedraggled by August — but — it is gathering steam to put on a fall show! Like Margene, I am sad to see the light fade away . . . I put up with August so that we can get to September 🙂 I like the seasons changing and documenting my days by what I witness. Our humid weather is easing up again, I'm so looking forward to that. While I will be sad to see summer go, I just love fall! Especially because we go to visit the kids – makes autumn extra awesome!